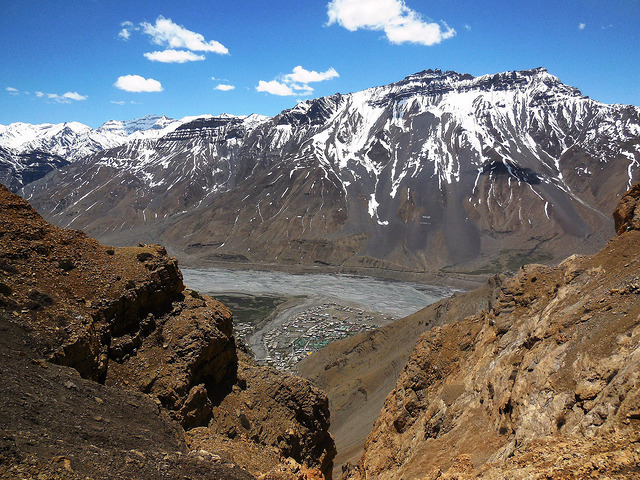 Himachal - Spiti Valley - Kaza, Kibber - Ghumakkar - Inspiring travel experiences. 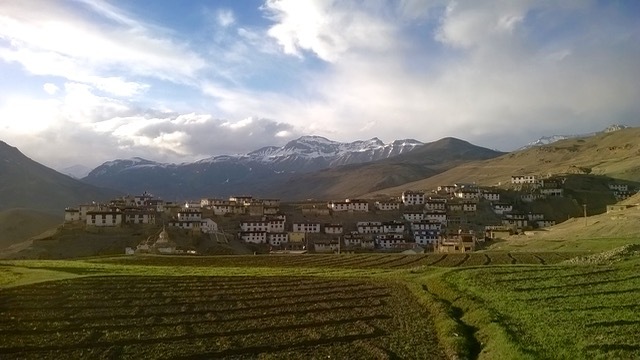 Today we were to go to high altitude villages near Kaza namely Langcha, Komik, Hikkim & finally to Kibber where we are going to stay overnight. 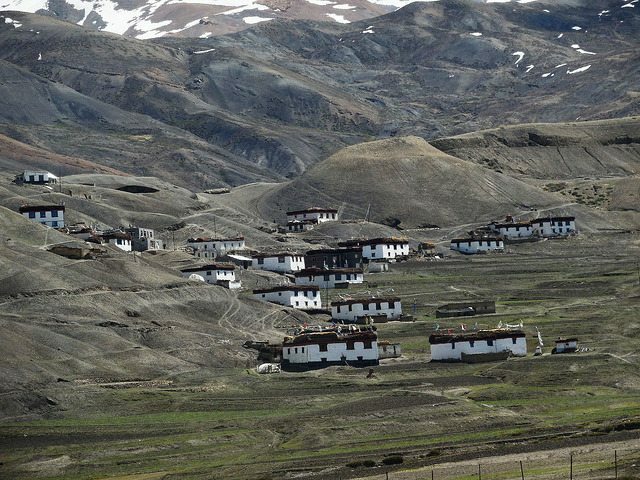 These villages are one of the highest inhabited villages in the entire world all year round. These villages are just a bunch of flat-roof, white-walled, dark-windowed houses among some fields and nothing much. People here collect dry wood and twigs on the roof for the winter season when they burn them to keep the home warm. 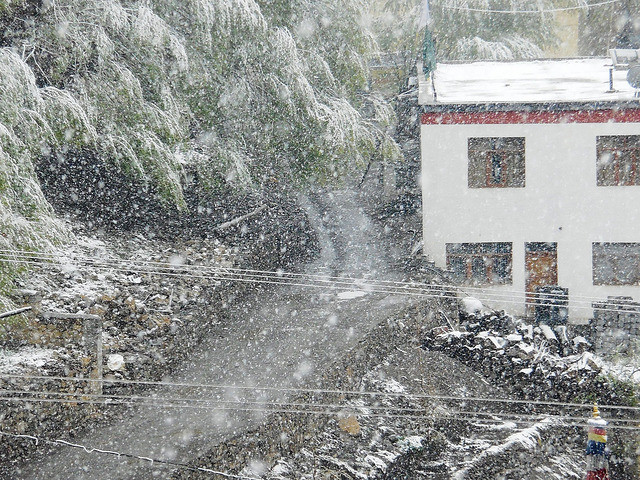 Temperatures here drop upto -40C in winters and for prolonged period. In summers they till the nearby land and grow peas, potato etc. Langcha has a huge Buddha statue in the open which is visible from far. 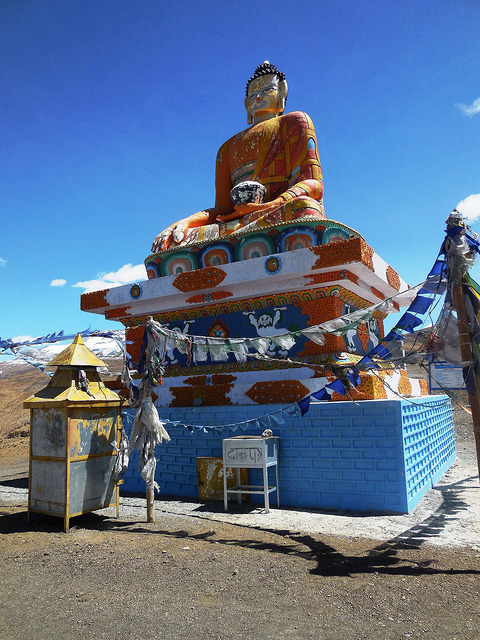 It is one of the unique Buddha statue in such a setting surrounded by high-peaks. 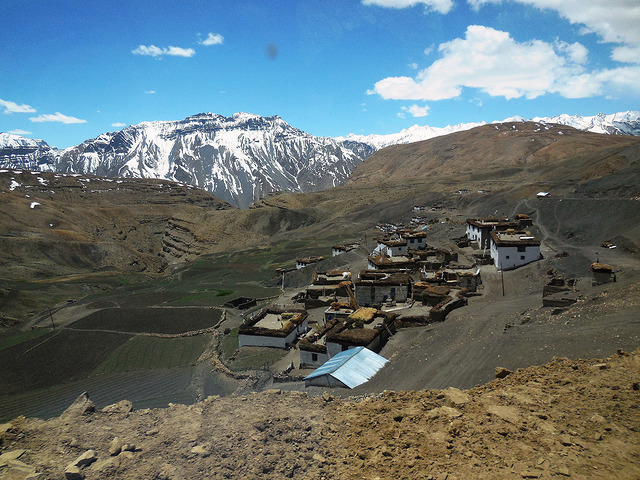 After visiting it, we went to Komik which is another high altitude village. There is a small monastery here which we visited. We also a hot-tea made by monastery folks for us. While going back we just passed Hikkim village which supposedly has a post-office for this region. Even though it was late May but ice had not completely melted and at many locations the ice was still collected in mounds. We stopped at one of them to enjoy making and throwing snow-balls which my son enjoyed very much. 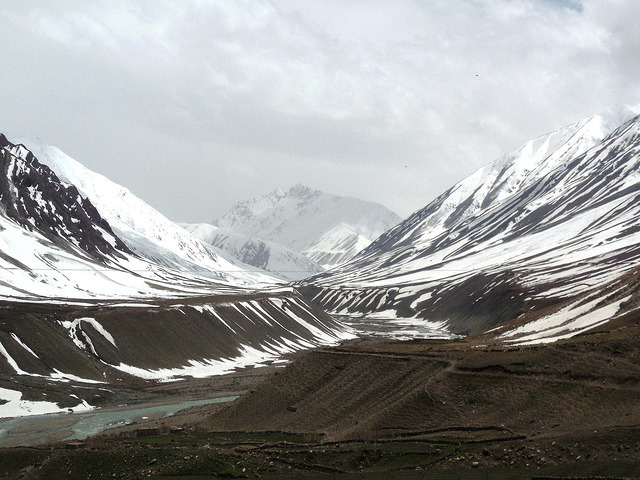 We came back to Kaza as road to Kibber was a little different. Today we decided to try local cuisine which is Thupka and Veg Momos. Here, one mostly gets mutton Momos, hardly Chicken and Veg momos have to be specially ordered. The meal was nice and we were ready to proceed to Kibber. 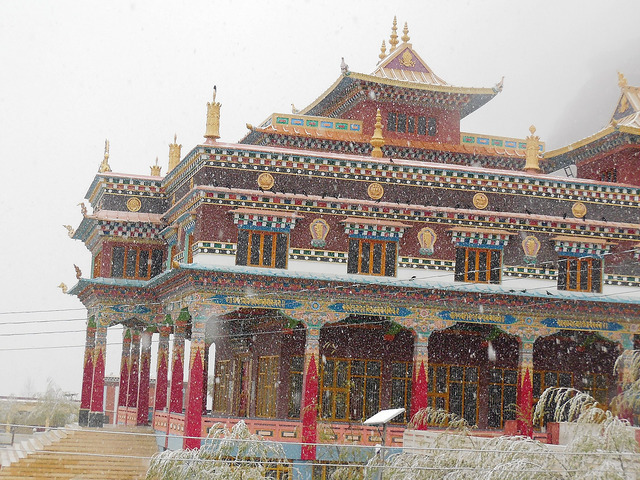 The road to Kibber goes via Ki Monastery but we decided to visit it while coming back next day. 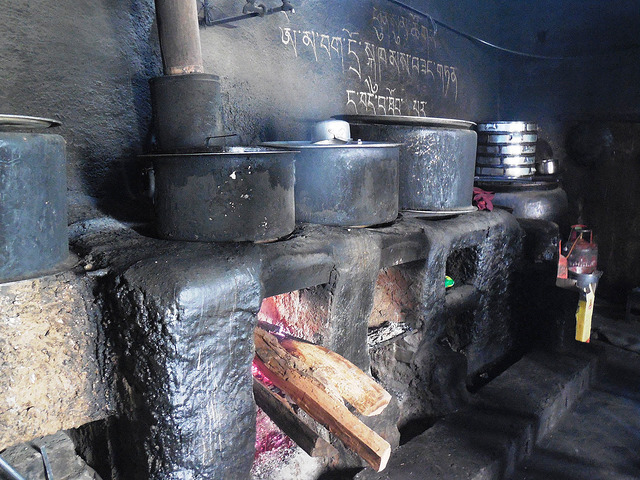 At Kibber we stayed at Tashi Zom guest house which was just before the village separate from the rest of the village. It was really sunny, windy and chilly outside so most of the time we stayed indoor. I went out a little to take a walk around the guest house and inside the village. This is a proper village with a school and a game of volleyball was going on. There are other guest houses and this village witness some tourists. Here I met Mr. Anurag Jately and his assistant. He is ex-NGC, ex-Fox Traveller head of programming for them and he was shooting night sky in timelapse, phew!! I was just awestruck listening to his anecdotes and watching some of his work on his laptop. 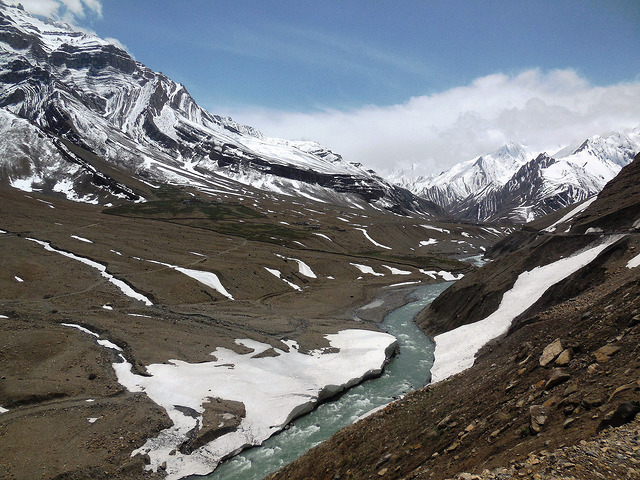 He had come to Kibber on his Mahindra Thar with 250kg of photography equipment. They would set out only at night after 11PM and come back by 3-4AM after putting their cameras at multiple location. He invited me to join him but thinking of dark night in such altitude, forget about the chill what about if there is a miss of a skid??? I simply did not have courage to step out leave alone go with them at such time and I was anyway grappling with my thoughts of high-altitude dizzyness. He told me to have a look at Milky way which is visible to naked eye when it rises around midnight. I braved a small 15-20 minute outside the guest house and really looked at the Milky Way. Our room was completely wooden and even had provision to burn wood in a wood-stove which we enjoyed. We started from guest house and walked through Kibber village among the villagers. People were bust in their chores and children were smiling, playing. This is probably the best time of the year for them. 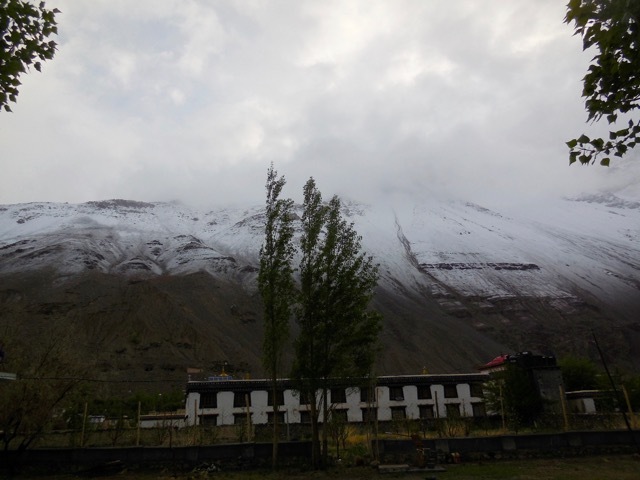 We took a detour to Kaza via Chichum. 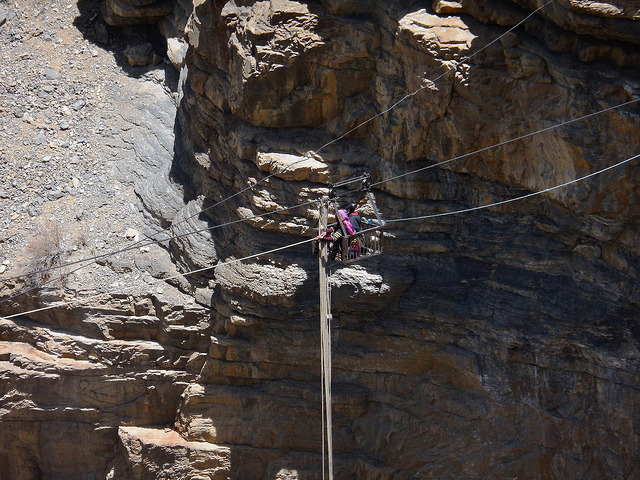 This is a village which is across a deep gorge from Kibber and the road it too circuitous and time taking, so there is a hand-operated rope trolley which locals use to cross over. We witnessed one such crossing by a woman and her child. The guide told us that its quite tiring to operate the trolley. We slowly descended from Chichum. 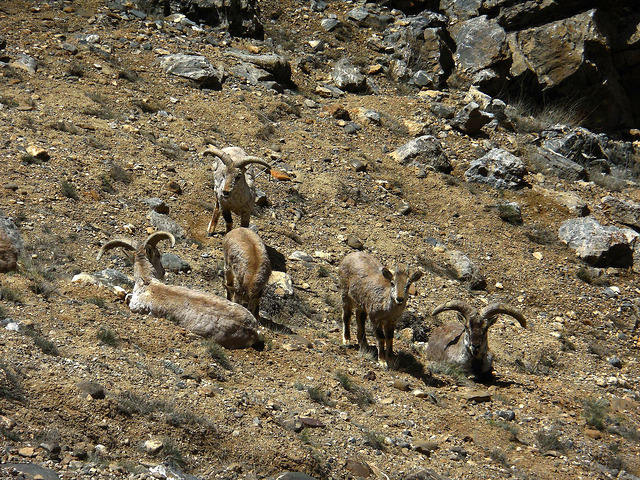 At one point, we saw group of blue sheep which is local to this place. We came down and went to Ki Monastery. It is located at the top of small hill like vanilla ice-cream on a cone. 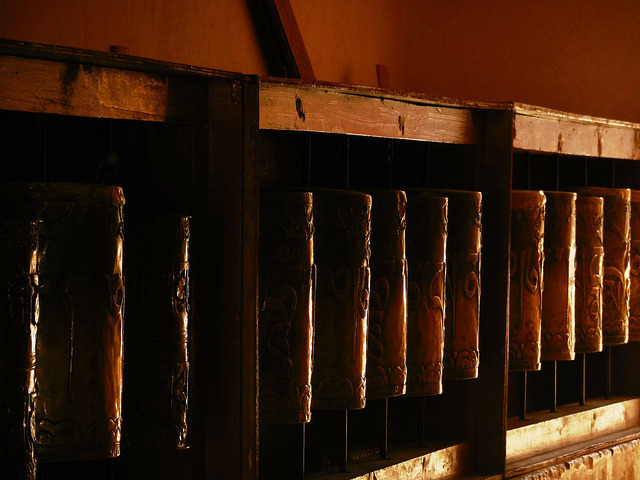 Like other Buddhist monasteries they allow visitors to roam around the monastery. Our guide took us through all parts of the monastery. Young lamas were chanting in the open and some of them giggling at us while taking photos. Older lamas were busy in their chores. We went to their kitchen and had tea there. There was preparation going on for lunch. Cooking was all wood fired. We went to the terrace of the monastery for sweeping view of the river valley. 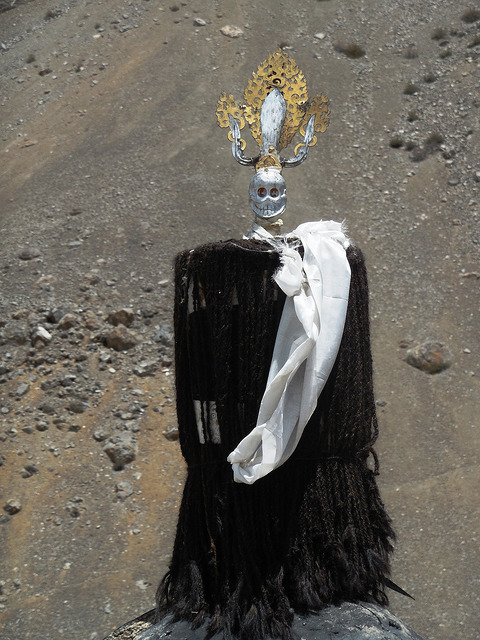 There were some figurines which are meant to drive away the evil spirits. 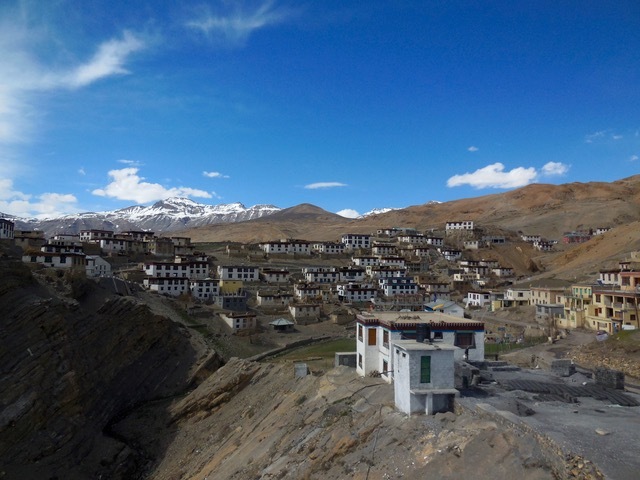 After spending enough time came back to Kaza and checked back into same hotel Spiti Valley. This time we were the only guests. 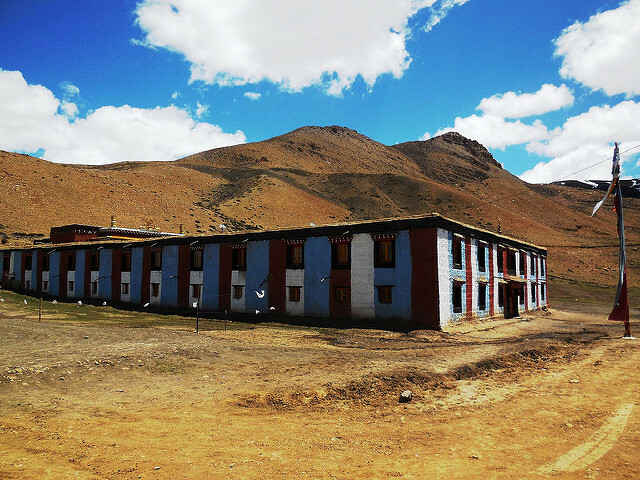 The hotel is run by a local couple both of whom are government servant in a local school. Since there were no guests to attend the owner interacted with us. Most surprising was the owner had been to Nagpur for doing a course in Physical Education. I am from Nagpur and it is notorious for being the hottest places in India. 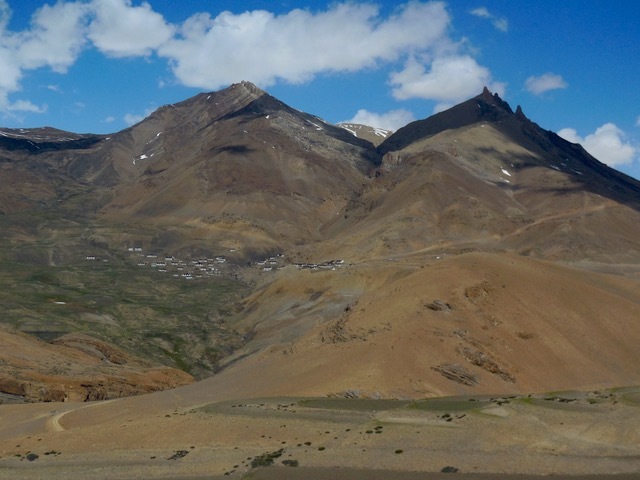 This first question was how an inhabitant of Spiti could survive in the heat of Nagpur? He told us that government job is the most sought after occupation here as private enterprise is limited. We slept not knowing what was in store next morning. Next morning when I woke up, it was snowing and entire valley was covered in snow and white. This was something we did not anticipate so were naturally thrilled and played with snow on the terrace. 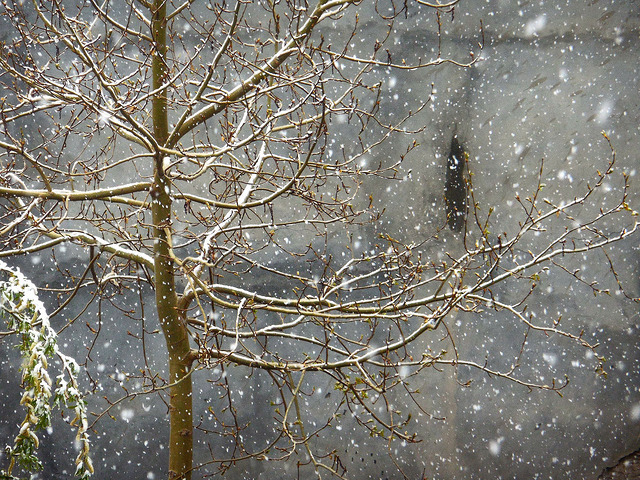 It wasn’t a heavy snowfall and it soon stopped. 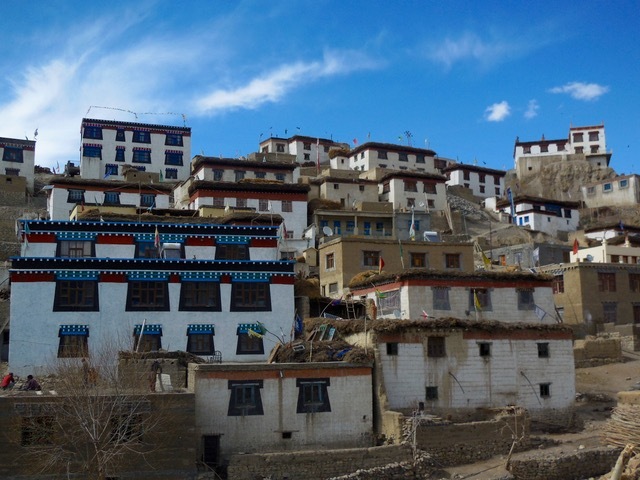 Our guide made a small change in itinerary and instead of staying at Kibber for 2 days, we thought of spending an additional day at Tabo and visit Pin valley instead. 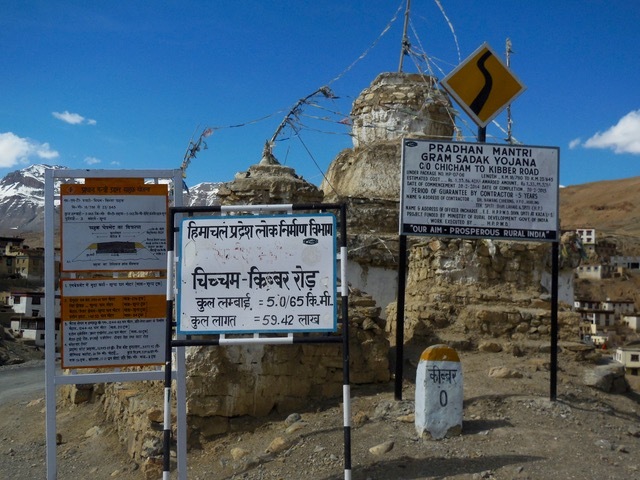 There is a village called Mud which is the last motorable village in Pin valley around 35 km inside the road to Tabo. 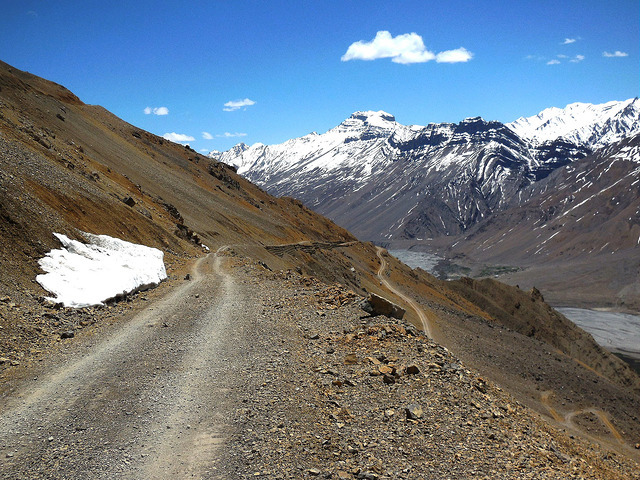 The road follows the Pin river and is into Great Himalayas as against Trans-Himalayas of Spiti valley. The road was pretty treacherous but with great views of snow-covered mountains so close probably from last days snow fall. There was lot of ice still not melted around the road. Pin valley is supposed to be very green but we were a little early in the season. Mud is one of the end-point of Pin-Parvati trek who goes over Pin-Parvati pass and comes down to a village called Wangtu which connects to the road to Shimla. 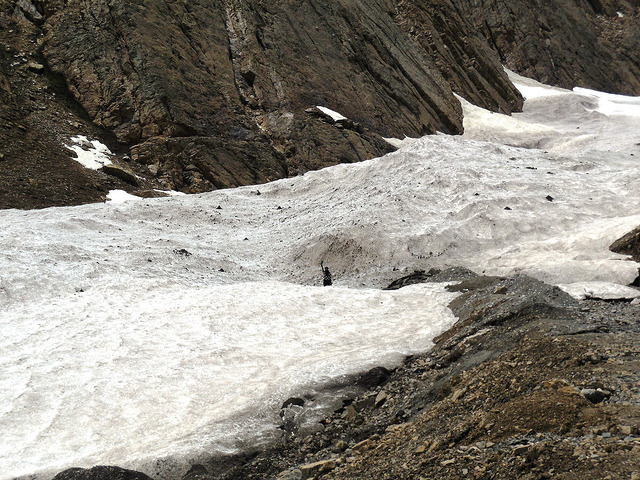 At Mud, there was literally a glacier over a mountain stream and we had lot of fun throwing snowballs. 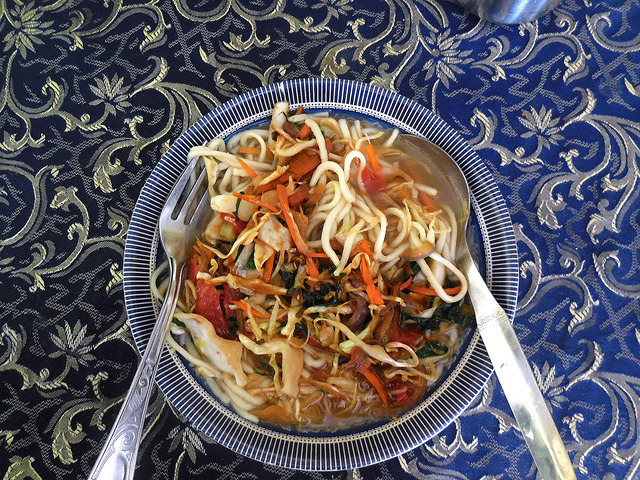 We had delicious (anything hot is delicious) momos and noodles here for lunch. 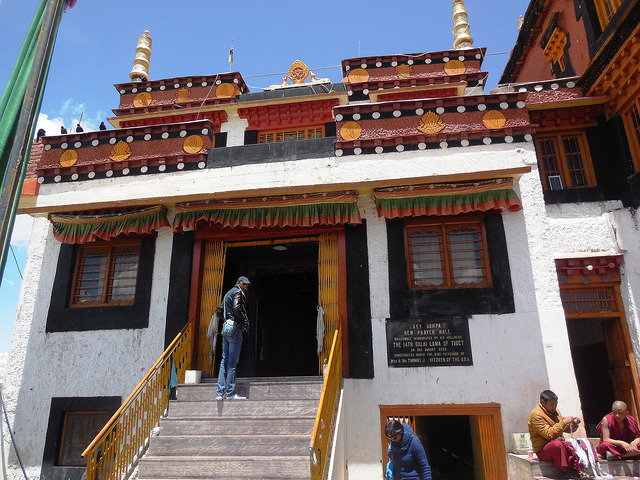 After that we traced back our way and came to Tabo and stay at Tashi Khangsar. Tabo is in an open valley with narrow opening so it is mostly windy. 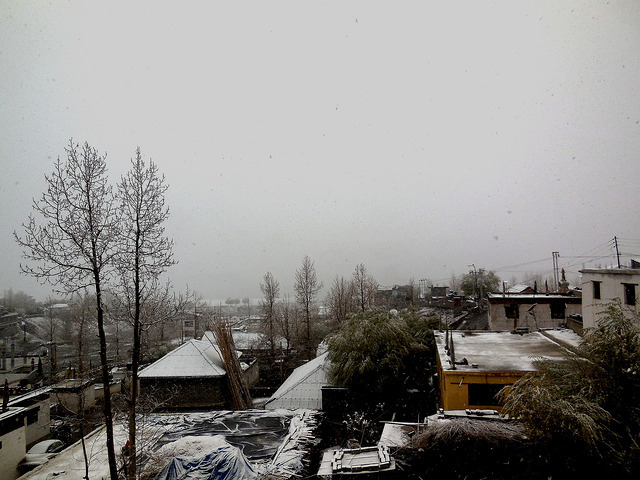 Next morning there was a fresh spell of snow-fall and the barren brown hills were white. Now we were backtracking our way back and due to over exposure of barren mountain scenery there was less enthusiasm. 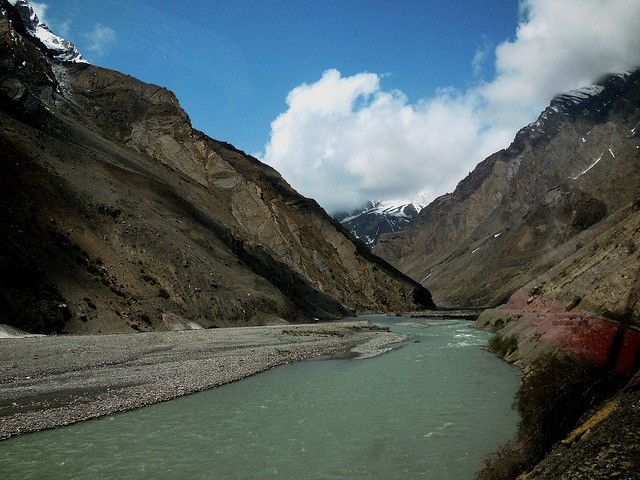 We stopped at a spot to get into the Spiti river basin and after some stone hurling and calm moments hearing the sound of the flowing river we made quick retreat to Kalpa which I was looking forward to. We reached Reckong Peo and again had lunch at the same Little Chef place with same Kinnauri Rajma. We checked in again at Apple Pie hotel at Kalpa. 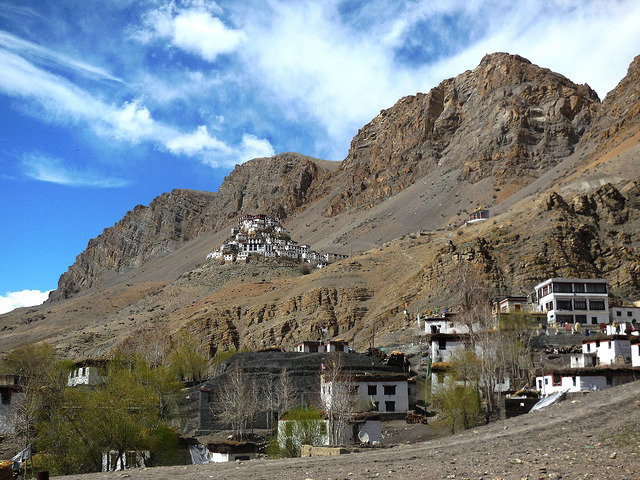 We had kept one day at Kalpa so we had next full dat to explore Kalpa and surroundings. Most of the time was spent spending time in the room looking at overcast and probably raining in the Kinnaur-Kailash range. Wonderful collection of pictures and great narration. Specifically speaking, I liked the interaction with Mr. Jately, post office, snow fall, rope-trolley and hot thukpa. Great experience. Thanks for sharing. 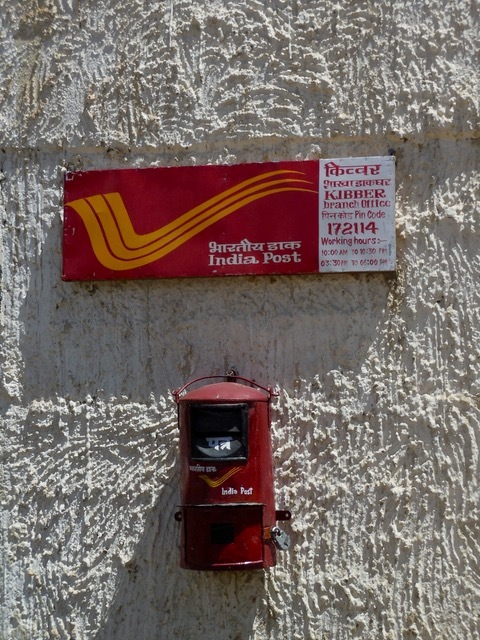 Dear Roopesh, fantastic post and pictures are absolutely breathtaking. Thanks for sharing! 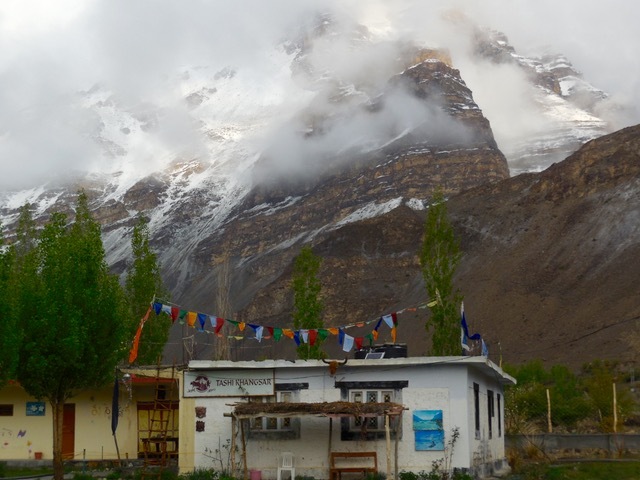 We stayed at Kaza and did a day trip to Kaza and Ki. We didn’t know that one can stay at Kibber. But as you said that it was quite chilly and windy in May, it was same in early June too and I can imagine that nights would get too cold so Kaza seems like a good bargain. Great writing, superb pictures ! Congratulations for a wonderful travelogue , Roopesh and thank you. We have been planning to do this trip for a long time. How many days did it take and how much did this cost you? It was really very nice..can u please tell why the roofs of the houses in jibber are covered with mud.. It was my 43rd holi. You must have guessed my age. But here I am not talking about my age. 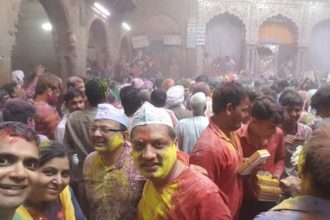 Here I am going to talk about Holi which I celebrated first time at Vrindavan with my beloved friends and their families and it was a lifetime experience. My childhood friends usually visit somewhere in India at least once a year with family. Which increase our bonding in between family and our child.